Westfield Football Club hit the woodwork three times and had a penalty saved during a defeat to second-placed opposition on Saturday. Bayley Colbran had all of those near misses, as well as scoring Westfield’s goal, in a lively debut as the Westies lost 3-1 at home to Roffey in Southern Combination League Division Two. Westfield chairman Jack Stapley said: “It could’ve been different. It just felt like 3-1 was a little bit harsh on us. I don’t think they could’ve moaned if it had been a draw. Colbran hit the post for the first time with a clever chip over Roffey goalkeeper Jack Reeves following a ball in from the left. Roffey took the lead moments later. With Westfield caught a bit high up the pitch, Marek Koutsavakis went through and was brought down by home goalkeeper Perry McNamee for a penalty which Pat O’Sullivan dispatched into the corner of the net. Westfield came agonisingly close to what Stapley described as what would’ve been the best goal he’s ever seen. Colbran met Ian May’s cross from the right with a left-foot volley from 25 yards which rattled the crossbar. Colbran also struck the outside of the post and had a penalty well saved by Reeves, who Stapley felt was fortunate to be shown a yellow card for tripping Jordan Harley as he was about to tap home. Both teams were slightly more flat during the second period, but Roffey doubled their advantage when Westfield failed to clear their lines and Koutsavakis chipped the ball over McNamee. Roffey added a third goal five minutes later. As Westfield committed men forward, they were caught by a Roffey side which is very good on the counter-attack and Tom Pillings found the bottom corner. Westfield nabbed a consolation when Colbran finally found the net, with a 30-yard volley which went in off both posts. Stapley said: “He’s definitely a mercurial sort of player. He’s got a little bit of spark about him, quite quick, strong, direct and clearly not afraid to have a go. I do think he will be a big plus for the side. Colbran scored three goals in 11 appearances for Southern Counties East League Premier Division club Crowborough Athletic earlier this season and has played for Westfield manager Mark Stapley at Tunbridge Wells in the past. Westfield: McNamee; May, Histed, Dicken, King; Higgins, Ferguson, Robinson (Charlton); Shelton, Harley (Harffey), Colbran. 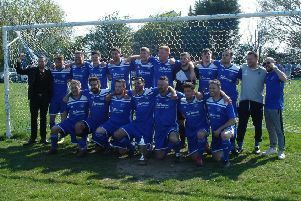 Westfield, who are 12th in the 15-team division, will travel to leaders Angmering Seniors this coming Saturday hoping it will be third time lucky after two narrow defeats against the table-toppers back in the autumn.